"We all know that the most impressive investment returns are from endowment funds and in particular, Yale and Harvard. Faber and Richardson take us inside these two funds and show us how to replicate that model for our portfolios. The Ivy Portfolio is an easy–to–read and –understand book that will make the process of asset allocation and investment easier for readers. And in light of the recent market turmoil, its lessons are even more important." "Meb Faber makes a most compelling case for quantitative active asset allocation. ?Investors of all levels of sophistication will benefit handsomely from the insights and analyses presented in The Ivy Portfolio." "Analysis of institutional holdings (13F analysis) is one of the most useful yet underused tools in an investor′s research arsenal. 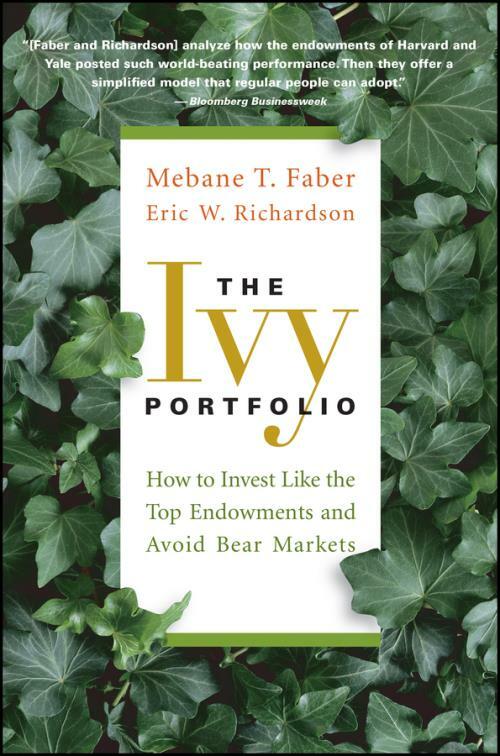 Along with taking readers into the arcane world of endowment investing, The Ivy Portfolio provides actionable advice on how to trade alongside the top investment professionals of our time." A do–it–yourself guide to investing like the renowned Harvard and Yale endowments. The Ivy Portfolio shows step by step how to track and mimic the investment strategies of the highly successful Harvard and Yale endowments. Using the endowment Policy Portfolios as a guide, the authors illustrate how an investor can develop a strategic asset allocation using an ETF–based investment approach. The Ivy Portfolio also reveals a novel method for investors to reduce their risk through a tactical asset allocation strategy to protect them from bear markets. The book will also showcase a method to follow the smart money and piggyback the top hedge funds and their stock–picking abilities. With readable, straightforward advice, The Ivy Portfolio will show investors exactly how this can be accomplished and allow them to achieve an unparalleled level of investment success in the process. With all of the uncertainty in the markets today, The Ivy Portfolio helps the reader answer the most often asked question in investing today "What do I do?" Part One. Constructing Your Ivy Portfolio. Chapter 1. The Super Endowments. Chapter 2. The Yale Endowment. Chapter 3. The Harvard Endowment. Chapter 4. Building Your Own Ivy League Portfolio. Creating an All–Weather Policy Portfolio through Indexing. How to Invest in Publically Listed Private Equity. A Brief Introduction to Hedge Funds. Options to Invest in Hedge Funds. Chapter 7. Winning by Not Losing. Out of Sample Testing and Systematic Tactical Asset Allocation. Blood in the Streets (Pop out?). The Systems vs. the Endowments. Chapter 8. Following the Smart Money. Combining the Top Fund Managers to Create Your Own Fund of Funds. Chapter 9. Develop an Action Plan. Portfolios Mentioned in The Ivy Portfolio. Appendix A: A Brief Review of Momentum and Trendfollowing.